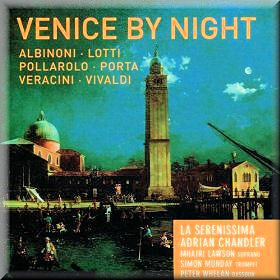 This imaginatively programmed disc takes us on a nocturnal Venetian visit. Its breadth of programming ensures that a number of important genres are encountered, not least concert and operatic performances, and if one is still left musically unsated, one can always enjoy ecclesiastical and private music soirées whilst in the city. Not the least of the charms of the disc is that – with no disrespect to the Red Priest – other composers’ works are explored in addition to Vivaldi’s. In short, there is Venetian variety on display. This thematic arrangement – gondola, concert, church and the others – brings a kaleidoscopic approach to music in the city. But for all its august status Venice also admits our old friend Anon. The Gondola conceit allows anonymous vocal settings, sung by Mhairi Lawson with varying accompaniments. Brief though they are, they prove charmingly ingratiating. ‘A Private Concert’ introduces Pollarolo’s Sinfonia, a 1707 work largely recycled from an opera. It’s dispatched by trumpeter Simon Munday with commendable authority and no little panache. We also hear Albinoni’s Sinfonia in G minor, with a characteristically lovely slow movement. This private concert ends with Vivaldi’s Bassoon Concerto in C RV477, played in a communicatively chuntering style by Peter Whelan. The slow movement with its yearning ascending line is particularly attractive. If you need spiritual nourishment, Music for Compline opens the door to Veracini’s Fuga for strings and continuo, a crisp polyphonic piece played with strong string articulation. This work prefaces Antonio Lotti’s motet, Alma ride exulta mortalis. This Feast Day motet reveals once again how adept was Lotti at vocal settings. The highlight of this compact piece is surely the ritornello-adagio with its ‘rolling’ lyric line and hugely sympathetic melodic curve. An interlude is provided in ‘A Concert from the ospedale della Pietá, in which the musical tourist can enjoy Vivaldi’s Violin Concerto in E minor RV278 played by Adam Chandler, the soloist and director of La Serenissima. It’s shaped with real sensitivity, and proves a highly musical study in the Venetian art. Finally we arrive at ‘The Opera House’. We hear Giovanni Porta’s Sinfonia in D where Munday is once again heard to strong effect. And then finally it’s back to Vivaldi for two arias written for the castrato Marianino Nicolini. The aria from L’Olimpiade is rather beautiful, whilst that from Motezuma is visited by many a harmonic twist and turn and imbued with plenty of drama. Lawson sings arias and recitatives with attention to textual detail and in unobtrusively excellent style. It’s certainly worth adding that the pieces by Pollarolo, Veracini, Lotti and Porta are noted as being first-ever recordings. The recordings, made in the Hospital of St Cross in Winchester, are first class and the notes – with full texts and translations – equally. This engaging journey, whether on land or on sea, proves highly successful.